Ever wonder what it was like for the team at Origin to support a game after its release? Thanks to this Privateer 2 Customer Service Manual, provided by Origin veteran Rhea Shelley, you need wonder no longer! This almost 300-page manual explains how to help with common problems with the game and also how to play through it in general (with flowcharts!) There's also lots of fascinating lore--like a list of the computer specs for each member of the QA team! 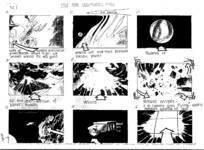 These are the drawings upon which every FMV sequence in the game was based... watch the movies and read along! One of the most interesting features in Privateer 2: The Darkening was the exhaustive text database of Tri-System lore that the game included. Because entries were 'unlocked' as the game progressed, many players have never read a number of them. Now is your chance to do just that, as we proudly present an article featuring the complete text of the people, planet and company databases! 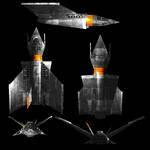 Enjoy a healthy dose of unusual Wing Commander history. 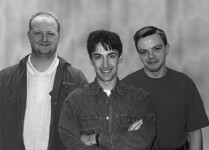 Paul Hughes has provided a set of images of Privateer 2's wingmen... who, it turns out, were mostly developers! I've formatted the pictures together with the in-game Booth descriptions of the pilots... and have attached Paul's notation as to who's who in 'real life'. As a bonus, there's actually two mystery wingmen, who don't appear in the finished game -- they're at the bottom. All news bulletins, extracted from the game. 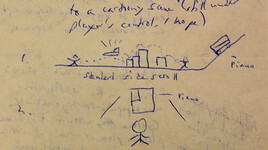 An account from Origin playtester Anthony Salter about the development of Privateer 2: The Darkening (from an Austin perspective). It's fairly incendiary, but it's also part of history -- it seems important to archive it here. We do know from talking to Erin Roberts and Paul Hughes that they were in the dark regarding a lot of the cross-studio criticisms and politics. 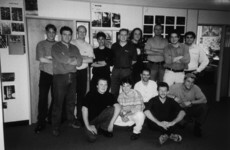 A great group photo of the Privateer 2: The Darkening development team! Take a close look at the details, too -- there's an area on the wall for each Tri-System planet! Special thanks to the always-gracious Paul Hughes for identifying the lineup. The official portraits for the Privateer 2: The Darkening team. They are: Adam Medhurst, Erin Roberts, Nick Elms, Paul Hughes, Tony Stockton and Brian Marshall. Full sized scans of the development team caricatures which appear at the end of the game! Hit escape after you found out Kronos' identity? 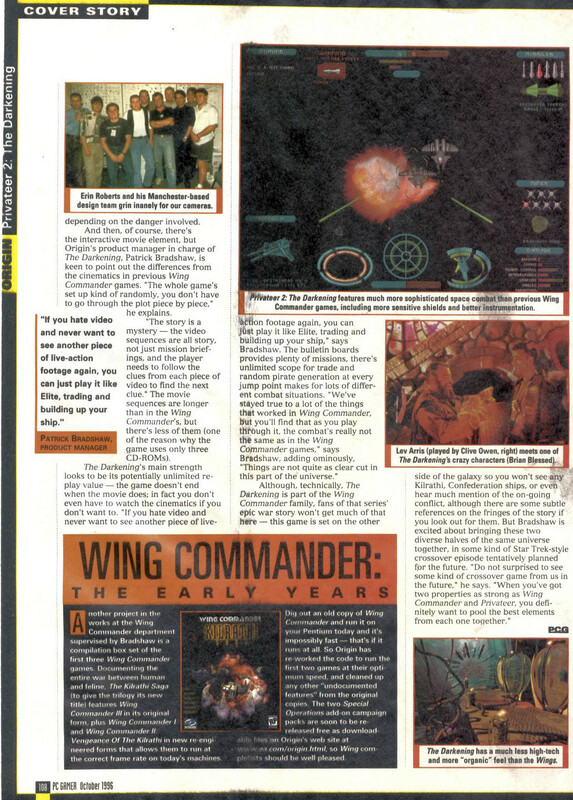 Then you missed one of the strangest Wing Commander credit sequences ever made... and now you can relive it! 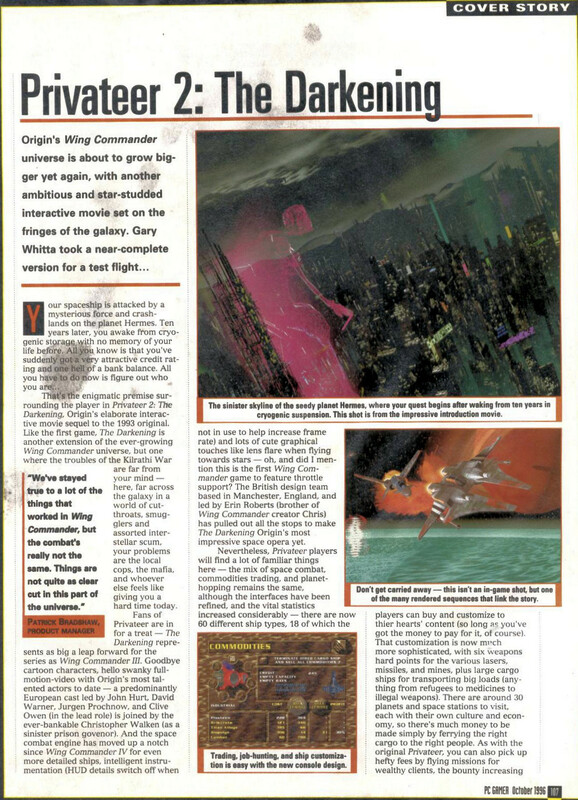 An extremely cool set of Privateer 2 Preview scans, featuring an article from the October 1995 issue of PC Format magazine. It includes interviews with The Darkening's acting talent and the men behind the cameras, Steve Hilliker (director) and Erin Roberts. There's also some cool set photography, for everyone who always wanted a better look at the Sinner's Inn! This issue featured a large spread on Origin's franchises, including a large feature dedicated to the upcoming Privateer 2 game.